Let’s face it, we all need to recycle more. Check out our tips for reusing what you have in the most inventive ways. This has become the mantra of a generation. The truth of the matter is that our planet is in serious trouble, and the only way to heal our home is by standing and working together. We can do that in small, everyday ways. Now, we’ve been told to recycle. But how do we do that? We see the slogans and sign boards, and we might do the normal amount of recycling. Can we do more? How can we be a little more creative and diligent in our recycling habits? That’s what we’re here to help you with. 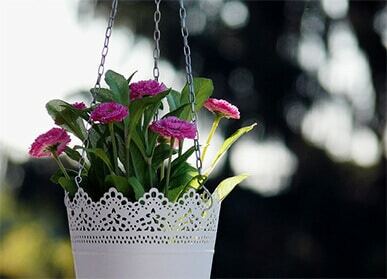 Here are 10 inventive ways that you can reuse seemingly useless items around the house. Take a plastic bottle, turn it on its side and cut out a rectangle. You will then need to fill the bottle with fertilized soil. Now you can plant seeds or seedlings in the bottle. Remember to punch a few drainage holes in the bottom. You can do this with a few bottles, string them up together and create a vertical garden outside. This is a great idea because the number of plastic bottles discarded every day is virtually endless. You’ll be giving these bottles a sustainable new life. This is also a good idea for when you don’t have a lot of space and desperately want a garden of your own. 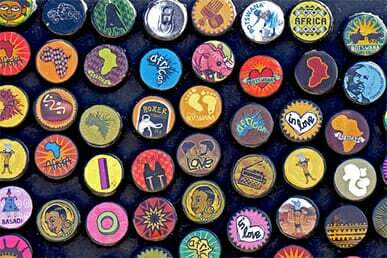 Take an ordinary bottle cap, any shape, size or color and it isn’t very special. But collect a few of them, turn them over and drill them onto a flat surface, now you’re on to something. You can arrange them in any pattern and use all the colors of the rainbow. This is actually a lot less complicated than it sounds. All you need is a plastic bottle, bleach and water. What you’ll need to do is mix the bleach and the water. Pour it into the plastic bottle then cut a hole into a galvanized iron sheet. Lightly sand the outside of the bottle and insert the bottle through the hole. Apply rubber sealant to keep the bottle in place. You can now install the light wherever you wish. This DIY light will be able to generate about 55 watts of light from the sun. This is perfect for a shed, out on the porch, or next to the pond. Take a bunch of old soda bottles, arrange them into a circle and tape them together. Now, you will want to wrap the sides, top and bottom with a soft pad or foam. Now, cover the entire seat with your choice of patterned material. Voila! There you have it- a delightfully whimsical ottoman that is sustainable and 100% unique! If you come across an old wood shutter, then you have just found a perfect recycled storage solution. Paint the old shutter and put it on your wall, a narrow wall is preferable here. You can store letters or important reminders in the slots and use a clothes pin to keep it attached. If you have a lot of magazines or books around the house, and don’t know what to do with them, then we have the ideal solution for you- stack them. Order a strap online and stack these items in any way you can think of. They will make excellent end tables or they can easily be stored in this way. It is best to form good habits while you’re young, and if you train your children to be eco-conscious, then that is what they will grow up to be. Check out this guide for some great kids craft ideas. This one is perfect for little girls. You can take any old soda bottle, pour some paint into a container. Lightly press the bottom of the bottle in the paint and now you have the perfect cherry blossom paint stamp! Stamp it onto a piece of paper or onto the wall for decoration. There is literally no end to what you can do with this simple instrument. Here’s an idea that is perfect for a little boy. Take two old soda bottles, tape them together (The cap side should be facing the ground), attach some string for straps and paint the bottles silver. Next, you’ll want to make some fire streams out of paper and stick them to the cap end. Your little one will be jetting off to far-off places in no time, and best of all, he will be doing so sustainably. This is a great idea for a family project that not only teaches kids to recycle, but also teaches them to nurture animals. You’ll need an old soda bottle, some bird feed, a few dowel sticks or colored pencils, and some string. Pour the bird feed into the bottle; then use the string to suspend the bottle in the tree. You’ll want to make some holes to insert the dowel sticks (or colored pencils) for little perches for the birds. 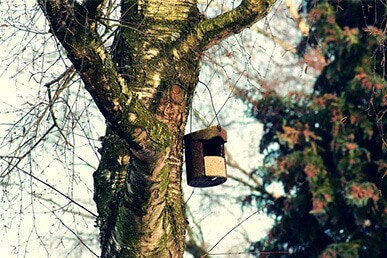 You’ll also need to make little holes above the perches so that the birds can feed. You can now choose a tree to hang the feeder, and watch from a safe distance until the birds are trusting enough to feed from your project. This will also let the children feel proud of their handiwork and make them feel closer to nature. Once you start looking at the world with a view to recycle, you’ll be amazed at the opportunities that arise. 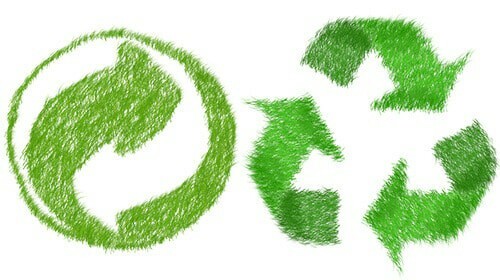 You’ll feel your creative juices beginning to flow and before you know it- you’ll be a recycling king/queen! There’s a whole world of possibilities out there, and trust us, you need to take advantage of it. So, start recycling! For further ways you can recycle at home and reduce your impact on the environment, check out our amazing guide to composting toilets and also our guide to compost bins. Follow us on Facebook to stay up to date with all the latest news in the tiny house world.